Natural sand kitchen allows young children to play in sand. The town is hoping to add a small water pump when more money is available. 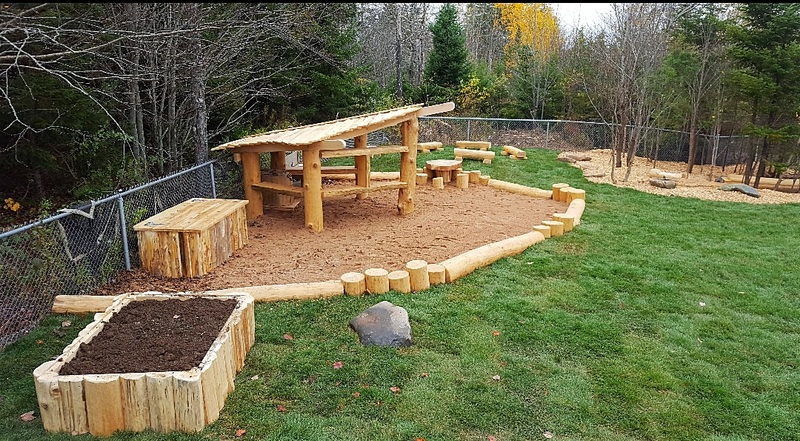 Sackville Town Council has awarded a contract worth $46,931.50 to a Nova Scotia firm for the design and installation of a natural playground at Lillas Fawcett Park. During their meeting last Tuesday, councillors voted to award the contract to Cobequid Trail Consulting Ltd. based in Economy, N.S. 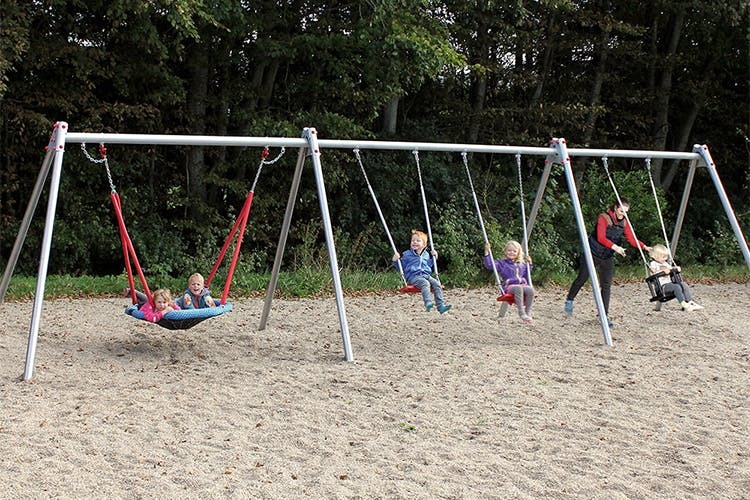 Matt Pryde, the town’s manager of recreation programs, says the money will be used to design and install a swing set with a bird’s nest swing, a log jam climber and a play area for younger children called a sand kitchen. Plans call for the installation of the equipment this fall in Phase I of a $97,500 project to replace the metal and plastic playground equipment in the park next to Silver Lake. At a council meeting in September, Pryde explained the concept of a natural playground. 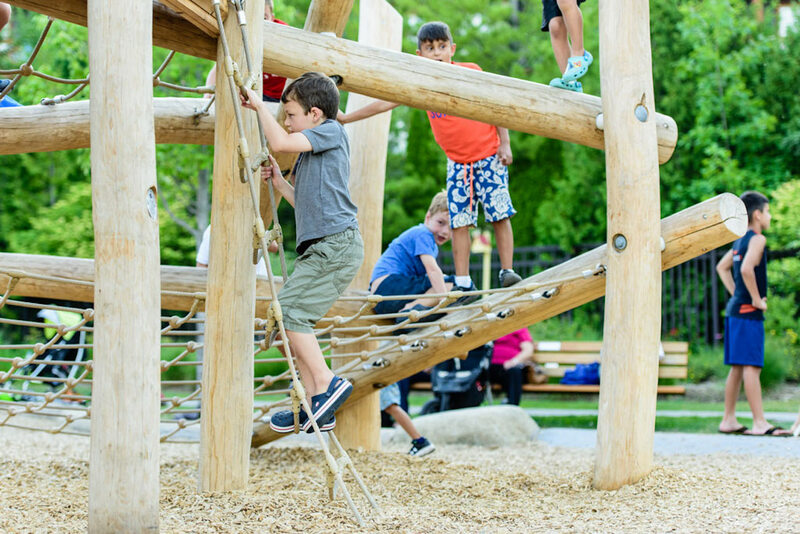 “Natural playgrounds are a lot like traditional plastic and metal playgrounds in that there’s still climbing structures, there’s still slides, there’s still opportunities for kids to be active,” he said. Pryde explained that Phase I will cost a total of $61,000. The money will come from a $22,500 provincial Regional Development Corporation grant, $7,000 from the town, $8,000 from TD Bank and $3,500 from the Sackville Rotary Club. The town will also supply $20,000 worth of in-kind contributions including installation of the new equipment. In the meantime, the town is hoping to get a $35,000 federal grant next spring to complete Phase II of the project. At its meeting on Tuesday, Sackville Town Council approved a revised five-year plan for work on provincially designated highways within town limits. The new plan gives priority to improvements at TransCanada Exit 506 including the reconstruction of Cattail Ridge to Bridge Street as recommended in a $27,000 plan proposed by Ekistics Planning and Design that council accepted in April. In the first year, the town is asking DTI to approve road reconstruction at Exit 506 that would cost a total of $310,000 with $108,500 coming from the town and $201,500 from DTI. To view the town’s 5-year highways plan, 2019-2023, click here. This entry was posted in Town of Sackville and tagged Cobequid Trail Consulting, Ekistics Planning and Design, Exit 506, Lillas Fawcett Park, natural playground. Bookmark the permalink. While I am sure this will be a great park, town council chooses to ignore sound budget setting and implementation. Let’s not forget there was a tax increase this past year and the original equipment replacement project was a modest multi year project with a current year budget of approximately 6.7K. Now there is money to spend $50K? Money lapsed from other projects should either not be spent or council should be presented with project options, not just one project, Were there any other parks in town that could be upgraded? How is it in September the original money allocated was not already spent – should the equipment not have been ordered and installed this past spring when it could have been used? Who made the decision not to follow through on an approved council project? Who can say no to a project that will allow kids to have fun? This being said, I agree with Brian Lane’s comment, which raised excellent points and critical questions (whilst acknowledging that this park will be great for children). Perhaps the budget for this project is more logical than the Sackville’s Arts wall ($41K!)? However, one can only wonder if we cannot find a better deal? Related to this question, what about any future maintenance costs, if any (some commercial playgrounds may now last up to 15-20 years, it seems). To conclude, thanks to our town, province, local Rotary Club, and TD Bank. I am wondering about the necessity of adding a “sand kitchen” to the Lillas Fawcett park – there’s even a note about plans to add a water pump later, when more funds become available. While it may be a great idea for a downtown playground, in this location I question whether it is reasonable. Let’s think about this for a minute – the location is at the beach, on the lake – there is lots of sand, there is lots of water for kids to play with … why do we need to add more? If the issue is ‘safety for younger children’, then I would add that parents should be either playing WITH their young children on the beach, or keeping a very close eye on them, at the very least. Adding what is basically a ‘sandbox’ to a beach setting reminds me of the old adage about ‘shipping ice to the north pole’, or the British version of it – ‘sending coal to Newcastle’. The swings and such at the current Lillas Fawcett Park playground have sand under them. To my knowledge this sand has never been a problem or concern. It’s not the end of the world, just a playground, at the beach, with some sand. Hmmmm — The whole $61,000 Phase One of this project looks to be costing about a $1,000 per peeled log before they are cut up. One can get a fairly nice natural cedar wood play set at Costco for $1,000. Guess I’m living in a different world than what I see happening these days. Or for $61,000 one could have just bought half a dozen brand spankin’ new Hyundais and let the kids play in those. Kids would love that. Earlier this year Town embarked on updating the expired Recreation Master Plan. Perhaps it might have been prudent to wait for the results before committing large amounts of money to one area. I don’t believe any councillor raised a question about the master plan review during public debate on the project.